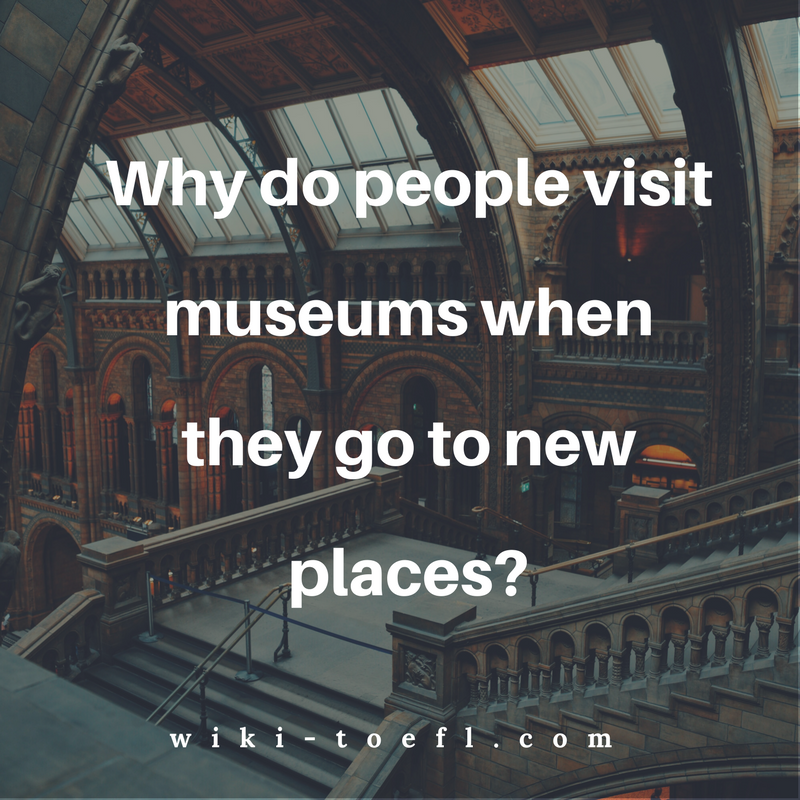 Toefl writing: Why do you think people visit museums when they travel to new places? Home Writing	Toefl writing: Why do you think people visit museums when they travel to new places? Many people visit museums when they travel to new places. Why do you think people visit museums? When visiting someplace new, you can find out about the culture of that place in many ways. You can go to a movie or a place of worship or a nightclub. Another option is to sit in the park and listen to the people around you. The easiest way to learn about a place’s culture, though, is by visiting its museums. Museums will show you the history of the place you’re visiting. They’ll show you what art the locals think is important. If there aren’t any museums, that tells you something, too. Museums are fun. Even if you’re not interested in art or history, there is always something to get your attention. Many museums now have what they call “hands-on” exhibits. These were originally designed to keep children occupied while their parents were looking at exhibits. However, museums have found that adults enjoy hands-on opportunities just as much as children. These exhibits have activities like pushing a button to hear more about what you’re looking at, creating your own work of art, or trying on clothes like those on the models in the museum. People also enjoy visiting museums about unusual subjects. For instance, in my hometown there’s a museum devoted to the potato. This museum has art made out of potatoes. It also tells all about the history of the potato, and sells potato mementos like key chains and potato dolls. People enjoy visiting this museum because it’s different. It’s not something they’d find in their hometown and the museum’s curator enjoy talking about the Great Potato. Museums are popular because they are about us. They reflect our creations, our values, and our dreams. No matter who you are or what you like, somewhere there is a museum that will amaze and interest you.